Computer Graphics Forum (Print ISSN: 0167-7055; Online ISSN: 1467-8659) is the official journal of Eurographics, published in cooperation with Wiley-Blackwell, and is a unique, international source of information for computer graphics professionals interested in graphics developments worldwide. It is now one of the leading journals for researchers, developers and users of computer graphics in both commercial and academic environments. The journal reports on the latest developments in the field throughout the world and covers all aspects of the theory, practice and application of computer graphics. CGF is published eight times a year (three regular issues and five special conference issues which are the proceedings of the annual Eurographics Conference, the Eurographics/IEEE VGTC Symposium on Visualization, the Eurographics/ACM Symposium on Rendering, the Eurographics/ACM Symposium on Geometry Processing, the Pacific Graphics conference) by Wiley-Blackwell. Further information on the journal, including recent and forthcoming highlights and the table of content of some recent issues, is available online. Prospective authors should also consult a separate page on information for authors. Finally,if you are a member of the Association with electronic subscription, you should have received user and password information to read all volumes of CGF on-line on the Eurographics Digital Library pages. 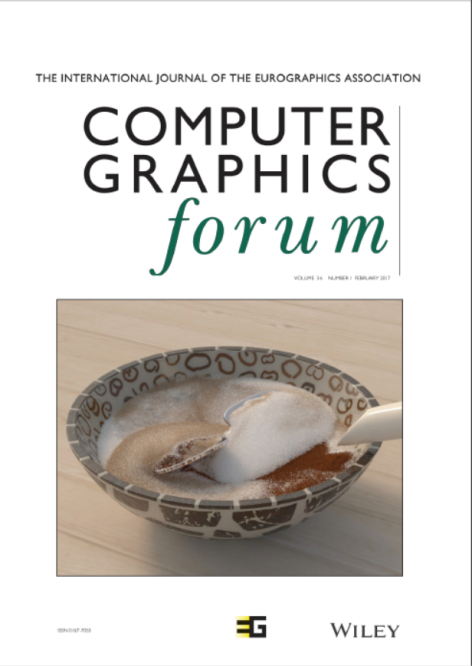 Eurographics members with paper subscription receive the three regular issues of Computer Graphics Forum as part of their membership. You can also subscribe to the journal directly at the publisher.